Wednesday morning I was awake around 6:30 and three hours later we were on our way! 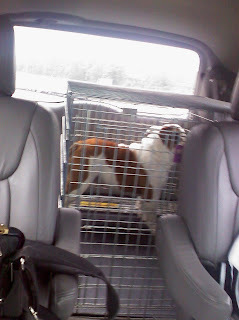 This was a first for me, riding in my crate. Not to miss a moment, I stood up just about the entire two and a half hour trip! Why, you ask, do I not have a comfy, soft blanket to rest upon in my crate? I must confess, it's my fault, till this day, I will chew on anything put in there so I'm left with the hard plastic floor. Not sure who was the most excited, me or my best buddy, upon my arrival at his apartment at school!!!! I ran straight to his bedroom and jumped on his bed. 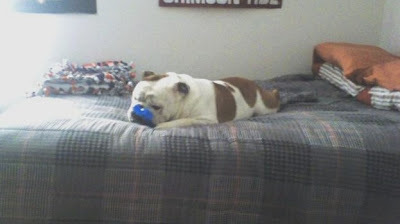 Here you see me resting on best buddy's bed with my favorite bone. Being awake since 6:30, not only did I miss my usual hours of sleep till noon, I was exhausted from standing up during the ride. Need I say just how much I enjoyed sleeping on his bed for hours? Later some of his friends came over and we hung out in the den....it was beyond awesome. Both of us were in "dog heaven"!!!! Mom and dad didn't stay, they had some ballgame to go to or something. The plan was for me to stay with mom and dad at the Residence Inn but I wanted to sleepover with best buddy and he wanted me to also. 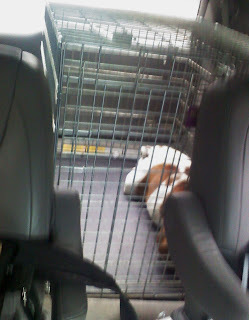 Mom and dad picked me up in the morning before he had class and it was back to the crate and another ride. This time I decided to get a little rest because it had been an exhausting, though wonderful trip. Hope all my four-legged good buddies out there get to have a sleepover sometime with someone you love! Big woof to Snuffles, Annie, Luna, Emma, Snickers, Dizzy, Friday, Lilah, Penney and Tonka! Cute, Apollo. Glad you had such a good time. Hope you can do it again soon. aaaw man oh man you are just soooo cute, i could eat you up, and i bet buddy thought so too. what an adventure you had. now you can sleep for a week. (btw. my two sons call each other buddy or bud). I can't believe he stood up the whole trip - what a funny doggie. He must have had such a good time at BestBuddies place! I am glad Apollo enjoyed his visit. It was a big outing for the little guy. Apollo stood up to see what was going on out side. Wouldnt you want to see everything on your first long ride to visit best buddy? Annie does that when going to the park to walk. stands between us on the arm rest from the Back seat. She lays and sleeps when just going to the market with us. How does she know the difference? She just knows.